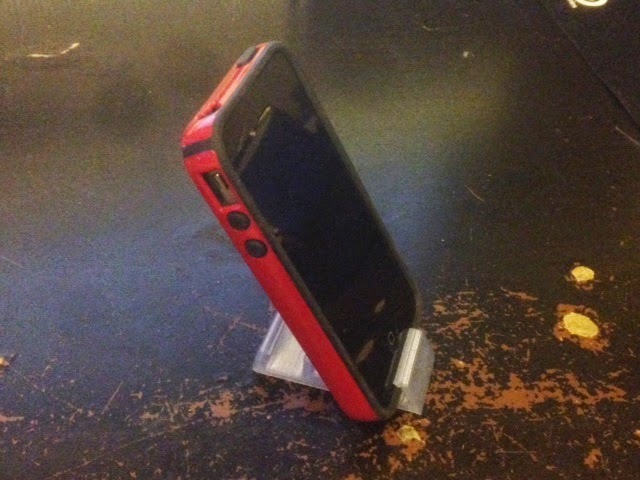 Print One: desktoplathes' iPhone stand with 2 settings. Can't get simpler than this. Very nice! The two angled positions work particularly well if you have a case on your phone, since the lip of the angle grabs the front lip of the case. 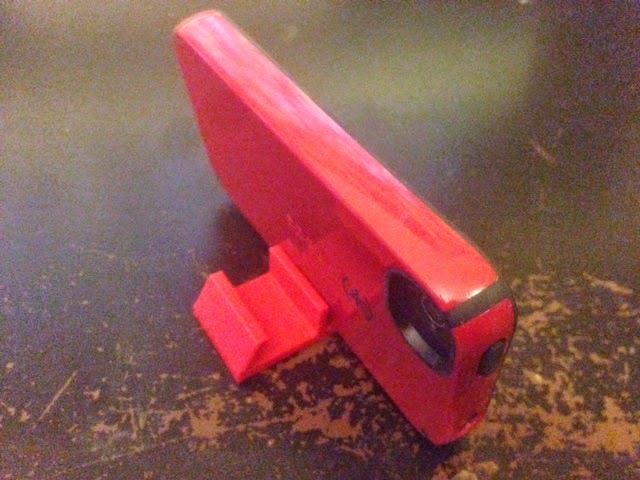 This results in a very sturdy stand, even though it is so small you could easily carry it around in your pocket. Settings: MakerBot Replicator 2 with raft but no supports, .3mm layer height, 22 minutes. 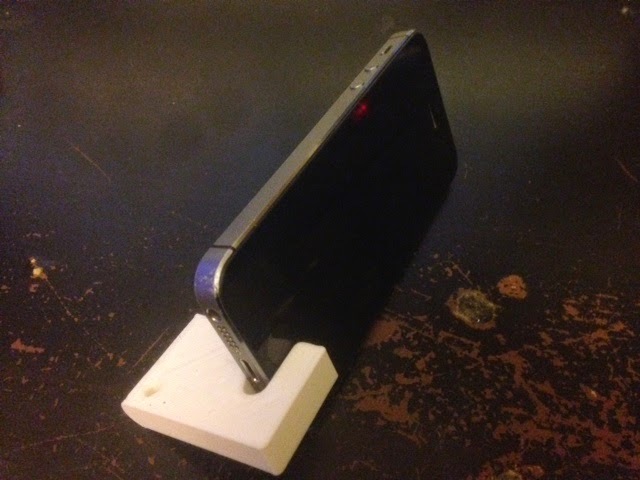 Print Two: SunnyJames' 6 Position iPhone stand. A lot like the one above but with an extra slot for when you want to stand your phone dead vertical. I can see that being useful for filming. The center slot is too small for our iPhone 4 with case, and too large for our iPhone 5 without case; but for the iPhone 4 with no case this is Goldilocks. The outside slots work with or without the case, with either iPhone model. Settings: MakerBot Replicator 2 with raft but no supports, .3mm layer height, 30 minutes. Print Three: adampaterson's Phone Stand Concept - Dual Angle model. This one is really interesting, and it took me a while to figure out how to use it. It turns out to be perfect for that super-low-angle position where you want to keep your phone on your desk and be able to use the touch screen. Yes! This is the only stand we printed that has this unique and very useful super-low position. Settings: MakerBot Replicator 2 with raft but no supports, .3mm layer height, 27 minutes. 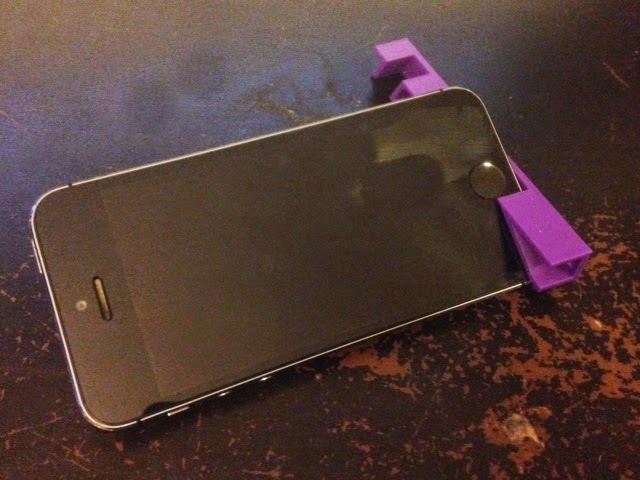 Print Four: JohnA's Kickstand for iPhone / iPad Touch. I love how tiny this is; you could even put this on your keychain if you wanted to. In fact, it has a hole that you could use to do just that! However I had trouble balancing my phone with this one, and sometimes I didn't get it quite right and the phone would fall over. Perhaps I need to print it at a slightly different scale to get it to fit correctly with my model of phone. 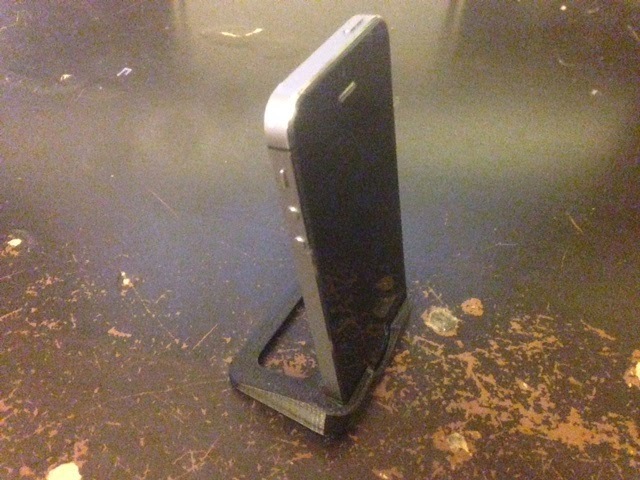 Print Five: tkramm's iPhone 5 Stand. This one took about twice as long to print as the others, but it has a really sleek and professional design. I'm glad to have printed this one in black; it looks great with the phone. It's also very sturdy and gives access to the button on the front of the phone. There's only one angle option but it is a good one. Fits our iPhone 5 but not the iPhone 4. Settings: MakerBot Replicator 2 with raft but no supports, .3mm layer height, 57 minutes. The verdict? Some are better for charging, some for watching videos, some for landscape, some for filming. And now I think we have enough iPhone stands for the whole family and I can stop printing them now. Actual Rep2 time < Estimated Rep2 time < Estimated Mini time < Actual Mini time.